1 Oz Canadian Maple Leaf Gold Coin .9999 Fine. 2019 Brand New, uncirculated gold Maple Leafs. All one ounce Canadian Maple Leaf gold coins contain at least 99.9% pure investment grade gold bullion. The coins are produced by the Royal Canadian Mint. The Canadian Maple Leaf gold coin was initially introduced in in 1979. The coin features the image of Queen Elizabeth II on the front, with the year and face value of the coin at the bottom. 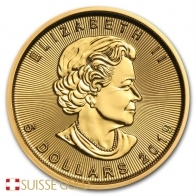 The 1 Oz Canadian Maple Leaf gold coin has a face value of $50 CAD. The reverse side of the Canadian Maple Leaf gold coin contains the image of a Canadian Maple Leaf. The weight, fineness and metal are depicted at the bottom of the coin. 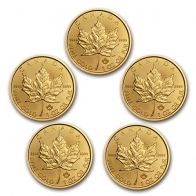 The gold Canadian Maple Leaf comes in 1/10 ounce, 1/4 ounce, 1/2 ounce and 1 ounce sizes. 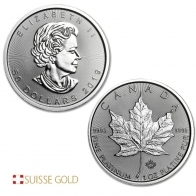 The Canadian Maple Leaf also comes in silver, platinum and palladium. In 2007 the Royal Canadian Mint also released the 99.999 fine gold Maple Leaf. The 99.999 fine Maple Leaf is the purest gold coin in circulation. Canadian Maple Leaf gold coins are very popular with precious metals investors worldwide, particularly in the one ounce size. 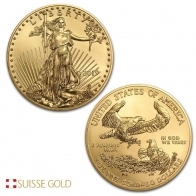 View today's gold price per oz. Contact us to sell 1 Oz gold Maple Leafs.